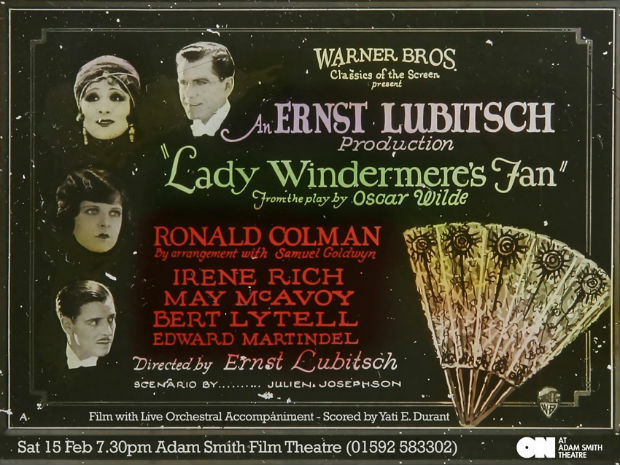 There will be a one-off screening of a rare silent movie classic, Lady Windermere’s Fan at the Adam Smith Theatre tonight at 7.30pm. The film is an adaptation of an Oscar Wilde play and was directed by Ernst Lubitsch. The film will be accompanied by a live orchestral score and promises to be a unique evening’s entertainment. The Adam Smith Theatre in Kirkcaldy is building on its growing reputation as an exhibitor of interesting and rare film content and as the home to the Kirkcaldy Film Festival, with this one-off screening of LADY WINDERMERE’S FAN, starring Ronald Colman and Mary McAvoy, star of THE JAZZ SINGER. The live score was commissioned by the Museum Ludwig Filmforum, Cologne from Yati E Durant, composer, musician and University of Edinburgh lecturer with a passion for silent cinema. His award-winning score is written for clarinet, piano and string quartet and is the perfect complement to Oscar Wilde’s story of a woman who is confronted by her husband’s suspected mistress at her own birthday party. There have been several film adaptations of Oscar Wilde’s play over the years, but this is seen by many to be the defining version. In 2002 it was chosen for preservation in the United States National Film Registry by the Library of Congress as being, “culturally, historically or aesthetically significant”. It was also voted one of the top ten films of 1925, no mean feat when up against THE BATTLESHIP POTEMKIN, THE GOLD RUSH and PHANTOM OF THE OPERA to name just a few of its contemporaries. Screening on Saturday 15th February at 7.30pm at the Adam Smith Theatre with live orchestral accompaniment scored and conducted by Yati E Durant. Booking: Tel: 01592 583302 Web: www.onfife.com. Tickets £10 / £7.50 (conc).